Save Money And Eliminate The Stress! Have fun during the holidays without spending a lot of money! Tawra Kellam and Jill Cooper have put together 75 pages of their most requested recipes and articles from LivingOnADime.com to help you save money during the holidays and spend your time focusing on the true meaning of Christmas! Get the Christmas On A Dime e-book today and enjoy a happier and more stress free holiday season! 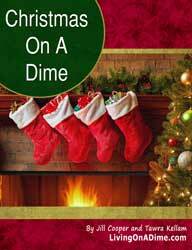 Christmas On A Dime is available as an e-book, which is available for immediate download. What is an e-book? Click here to find out. When your order completes, you will receive a confirmation e-mail with download instructions for your “Christmas On A Dime” e-book. If you experience any difficulties with your order, please contact us here.